$15 Special Offer! Last chance for a Garden Tour of the “living collections”. Climb, swing, splash, slide and bounce. Fun for all ages awaits in the Bayfront Gardens. A place of pure delight, the Dwarf Garden’s stone statues serve as bond between the visual and performing arts found at The Ringling. Michelangelo’s David oversees the Museum of Art’s central courtyard, the living embodiment of the ideal Renaissance garden. Enjoy a bay-side respite and bit of conversation along the Bayfront Promenade then stroll through a showcase of exotic tropical trees and plants. Mysterious and majestic, the estate’s 14 Banyan trees are the largest collection in Florida and a true source of wonder. 1200 rose plants in an Italian inspired wagon wheel pattern make Mable’s passion the Ringling’s most romantic place to rendezvous. 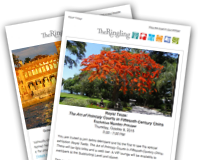 While visiting The Ringling you are welcome to explore the Bayfront Gardens at your leisure. As awe-inspiring as any work of art, The Ringling Bayfront Gardens are a living treasure. Courting couples statuary watch over Mable’s Rose Garden. The shade the majestic Banyan trees provide. The delight inspired by the whimsy of the Dwarf Garden. The echoes from the past where the Circus King finally rests in the Secret Garden. Enjoy the cooling breezes that blow along the bayfront promenade and Millennium Tree Trail. This is a place of nature’s making and man’s design. With the help of many dedicated volunteers we cut back all of the roses every February and October. During the cutback process, an organic fertilizer (turkey manure) is applied and at times a strong odor may be detected. During the spring clean-out we also remove mulch, add compost, and re-mulch. Upon completion of the cut back there are very few blooms. A nice flush of new blooms is expected approximately six weeks after each cut back.